There's almost no foot traffic in the West Bottoms area where I sometimes work. Tenants don't dawdle between their buildings and their cars, the dumpsters lack edible food, and off-duty police on motorcycles guard the contents of train boxcars. It's a bleak industrial district. So I was oddly encouraged when I recently bumped into a scavenger removing scrap metal from behind my building. It's surprising that he found something worth taking. The copper pipes this guy "liberated" wholesale for about a dollar a pound. So his haul will, at best, net him half that, maybe $15.00 if he's lucky. While that's a tough way to survive, it's preferable to toiling in another of the block's illegal activities. 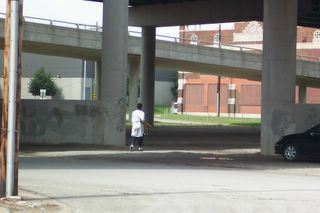 Under the same overpass, it's not uncommon to witness the world's oldest profession at work. And, trust me, it's not pretty.